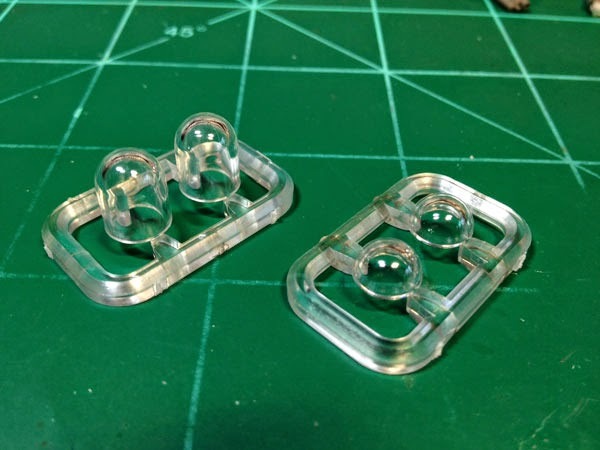 The BIGGEST NEWS is we have received the prototype parts of the helmet visor domes. They are in the actual clear injection molded styrene EXACTLY as they will be produced! The sample parts have been test fitted to the existing GDF model sculpts and their collars are keyed to fit the dome visors. All of these sculpts will go off to mold with this batch for mastering. 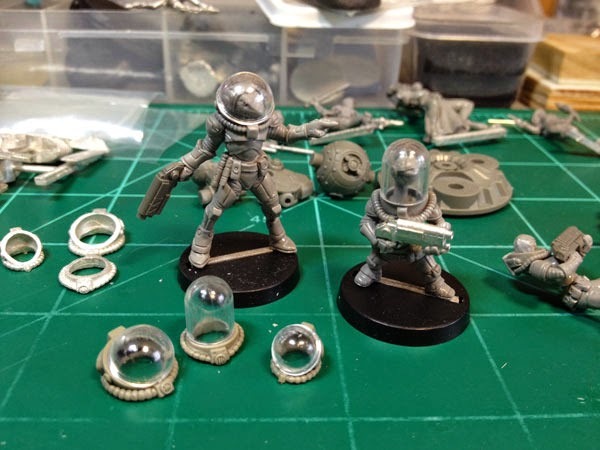 As of this posting, Bombshell Miniatures will be the only miniatures company producing 8mm clear styrene plastic hemisphere helmet domes for individual sale. All of the parts for the Mekkus and the Hopper bot have been printed and cleaned. 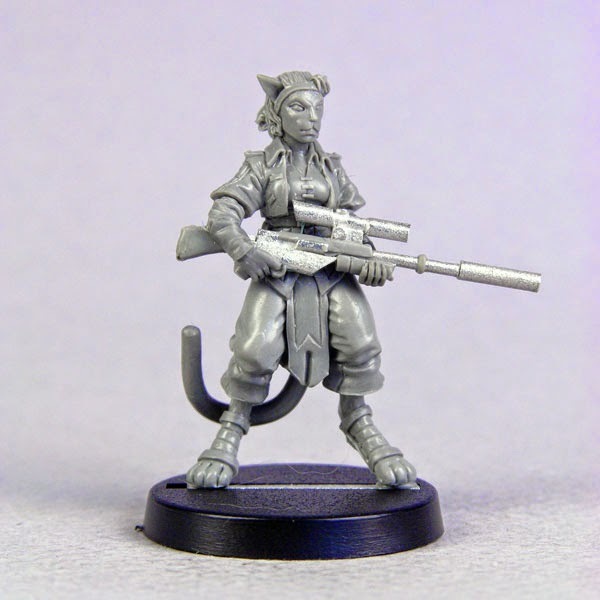 They will be included with the other completed sculpts for mastering as well. Another example of the bioengineered Edokin, the Eyespy looks like a spawnling with a prominent mass of eyes in its brain textured head. The Eyespy has a superior chameleon ability, capable of altering the color of its skin to avoid detection by the unaided eye. Its psi powers enable it to float swiftly about, searching for enemy troops or strongholds. 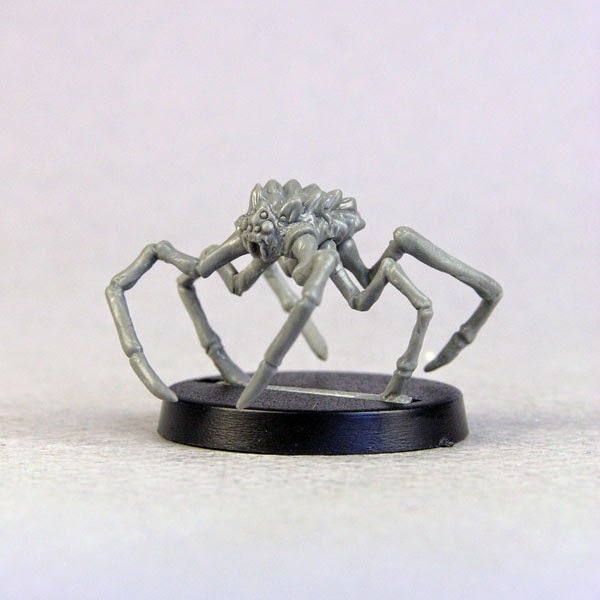 Upon discovering a foe, the Eyespy uses its enhanced optical organs to report what it sees to its fellow Edo to assist with targeting enemy positions. 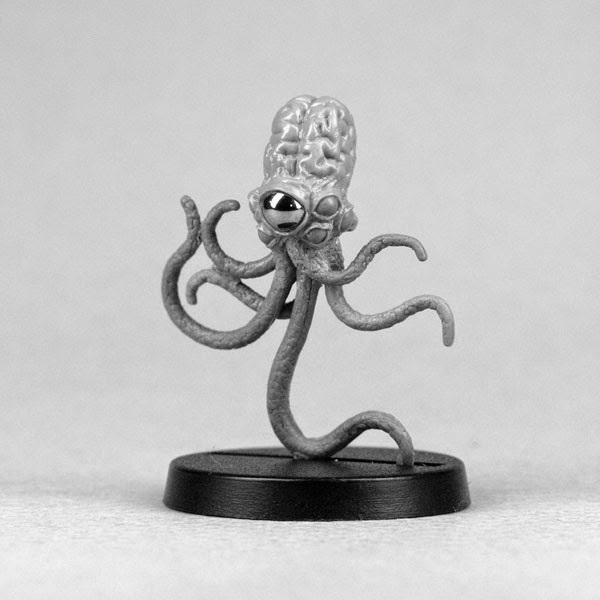 It also uses its Mind Probe ability to learn strategies and secrets from opposing forces. To defend itself, the Eyespy can generate a biocharged electrical field which can stun opponents similar to a Neuralizer pistol. 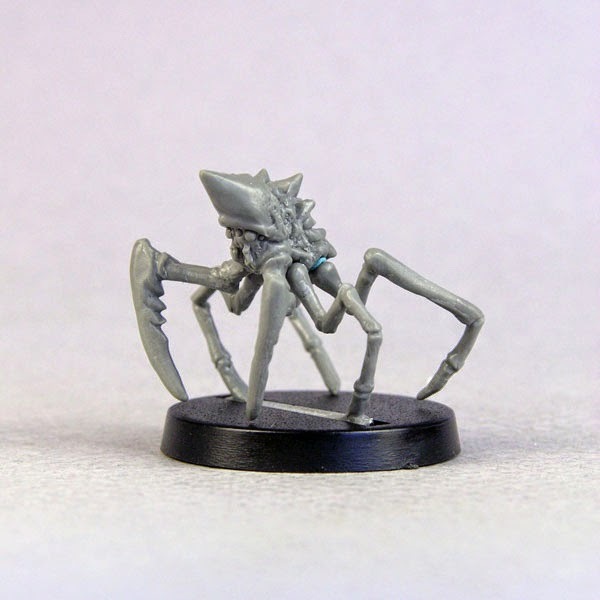 This completes the sculpts funded on the project. 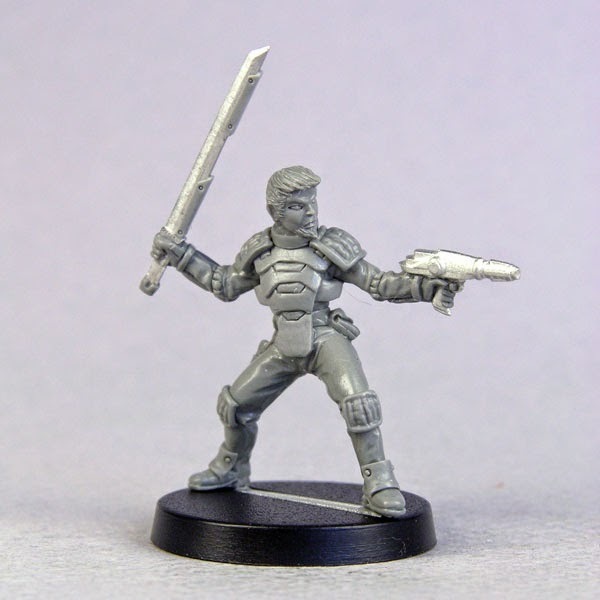 Production casting have already been returned for all of the Officer Helen, Particle Gun Sprues and the Illyrian/Edo prototypes. Vicky and I have been hard at work on assembling the rulebook. She has been going through each section of the Faction lists and writing new content as well as extensively editing the previous content she had written in the background overviews, force list entries, and narratives to bring it all in line. Most of the work I have been doing on the layout has been to whip the rules section into shape. 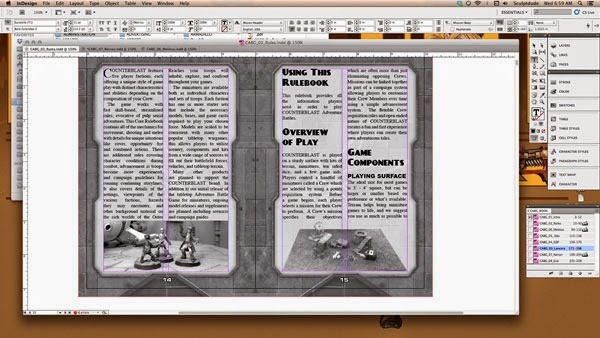 Brett has finished writing pretty much all of the rules section and now it’s just down to formatting the container. This still involves creating diagram graphics and placing spot illustrations along with border designs for the various sections. The bow on the whole package, though, is Matt Dixon’s fantastic cover art! We described to him what we wanted and as a big fan of classic pulp sci-fi he dove in with both feet. He faithfully recreated the look and feel we were going for – totally reminiscent of the pulp digest covers from the 40s! 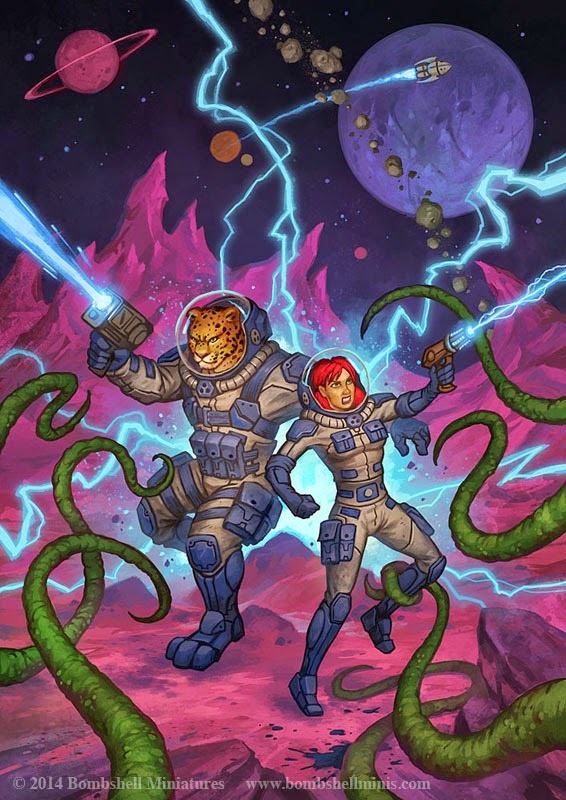 We are very excited to have this art to represent the first look into the Outer Reaches. As it stands, we expect to finish the book layout over the next week or so and get that off to the printer as soon as possible. 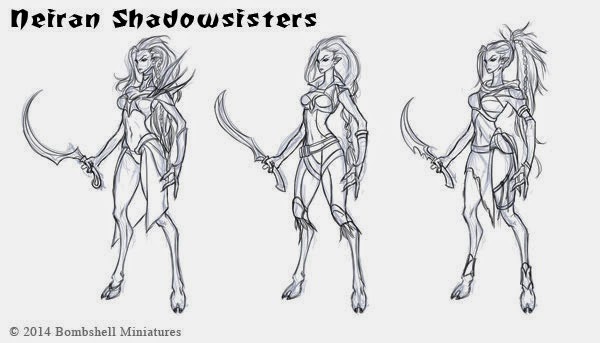 Jean Lee is designing several of the Neiran selections as well as a few large critters for the Edo and a Mekkus character. You can see more of Jean’s work here!